Chris stopped by to help rework the benchwork on the east side of town to make room for Hardware City Fuel Co. and also to improve the quality of the benchwork itself. The benchwork in this location has been added onto the side of the helix, although with the clearance within the helix it's difficult to attach the helix deck to the new benchwork. In addition, the benchwork began as an idea that I could fit a bookcase in this location, with new benchwork on top. The 'new' benchwork ended up being a heavily cut-down chunk of what used to be the Whiting Street Yard/Berlin Line. When I decided we could extend the track to allow more industries, we tacked on another piece of benchwork. But it seemed a bit much to add an additional section in this manner. So I started disassembling the benchwork and then found out Chris would be able to make it over to help. This is a little earlier look at the patchwork sections of the benchwork here. And here's what it looks like tonight. The bookcase moved last year, it took up a bit more aisle space then I wanted. That was an interesting project because it was supporting the benchwork directly. Today was easier since we just disassembled practically everything and rebuilt for the new sheet of plywood. It still required a bit of creative engineering, but it has improved the whole area and gives me a reasonable amount of space for the industries. The brown foam is now my roadbed. 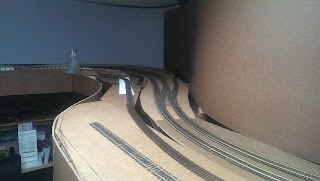 When I started the layout I used N-scale cork in the helix to allow just a bit more clearance. So when I just continued that on the entire layout. Pictures show that the track was basically right at ground level through the city. So I liked the N-scale for that as well. Except that when I started ballasting I found that it was really too high as well. So I've been using the foam as a scenery base, filling in the areas around the track. 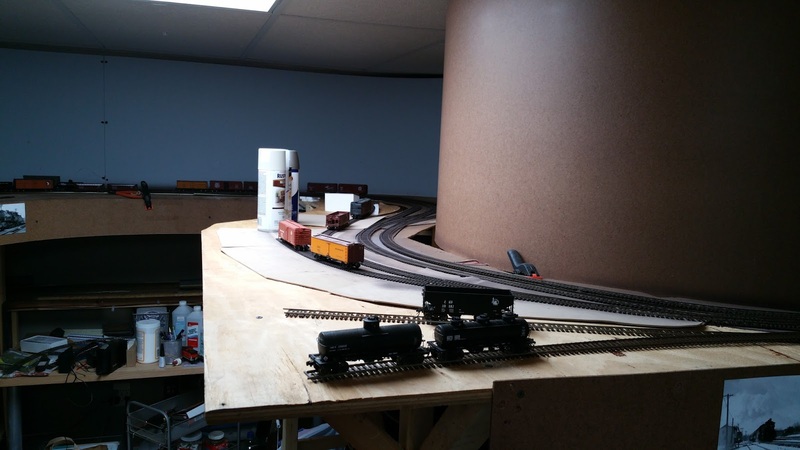 In areas where I'm adding track, like here, I'm just using the foam as the roadbed. It's a smidge lower than the cork, but that's just fine here for industrial sidings. It's also cheaper than sheets of cork. I have a bit more work to get everything in place, but it's really coming together.